Serve Caramelized onions with grilled burgers, steaks, sandwiches, Bacon Wrapped Bratwurst or hot dogs… and so much more! A bowl of caramelized onions deserves it place right next to the mustard, relish and ketchup. Or a top of the line steak and mushrooms side. Caramelized onions are sliced brown or red onions cooked on low heat until they sweat and turn brown. As they cook the natural sweetness in the onions intensifies. Adding balsamic vinegar and a bit of brown sugar enhances this process and creates a delicious result. I saw my first caramelized onions made on a flat griddle at a street fair a LONG, long time ago. They were then stuffed into a bun with a grilled bratwurst and sauerkraut. I hung around that RV kitchen all day inhaling those great smells and…I might have eaten one or two. Irresistible! 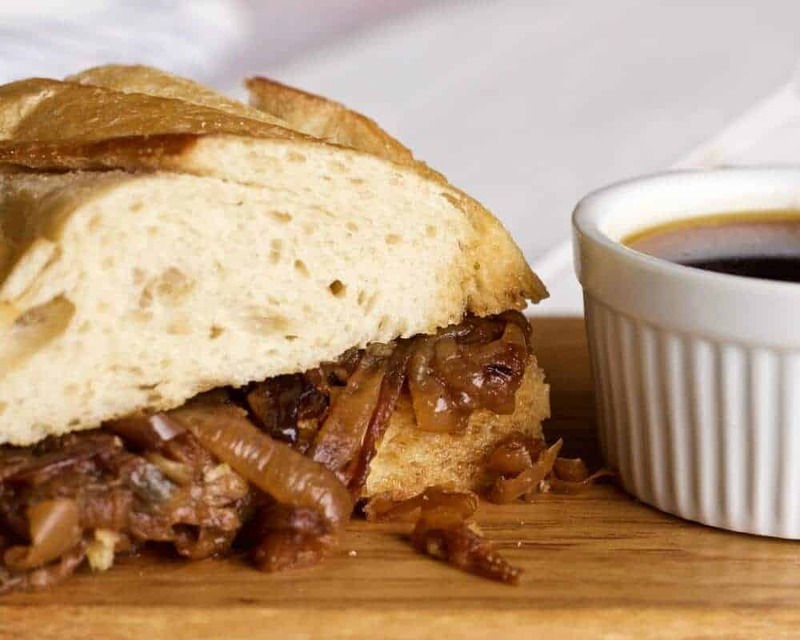 Caramelized onions adds a nice bit of sweet onion flavor to the French Dip Sandwich. I made my first batch of caramelized onions for crockpot French dip sandwiches several years ago. Caramelized onions compliment a roast beef sandwich and ALL sorts of other yummy meals. Grill a steak and mushrooms with caramelized onions on the side. So good! Caramelized onions are a great addition to many meals. These do take a while to make. Long enough that you may not want to make them every night you are planning to serve them. The good news is you can make caramelized onions ahead! Make a large batch of caramelized onions and it will hold in an airtight container in the fridge for up to three weeks. Just pull out enough for your meal and zap em in the microwave or reheat them in a skillet for a few minutes before serving. Even better! You can Freeze caramelized onions too! To Freeze them lay the caramelized onions on a piece of plastic wrap, squeeze out all the air and wrap them up air tight. Now double wrap them, seal and label(with the date) them. Pop them in your freezer. They will last in your freezer a month or more if carefully wrapped. To serve. Defrost the frozen caramelized onions on your counter. Reheat them in your microwave or in a skillet on low heat until they get sizzling a bit. Just careful not to burn them. caramelized Onions are easy to reheat in a skillet in just a few minutes. The make ahead aspect of these is a big plus for me. I also roast and freeze peppers. So handy to have them on hand and ready to quickly add to meals. Caramelized onions also are needed for Onion soups and other recipes so it’s not a bad idea to put some by for later. This is a good option for your onion harvest or if you find good sales on onions at harvest time. Making caramelized onions is an Easy Process. It just takes a bit of time and minding the skillet. I might try caramelizing onions in my instant pot just to see how they turn out. I like the results I get from my skillet method for keeping the onion rings intact without mushing up. Let me know your favorite method to make caramelized onions. 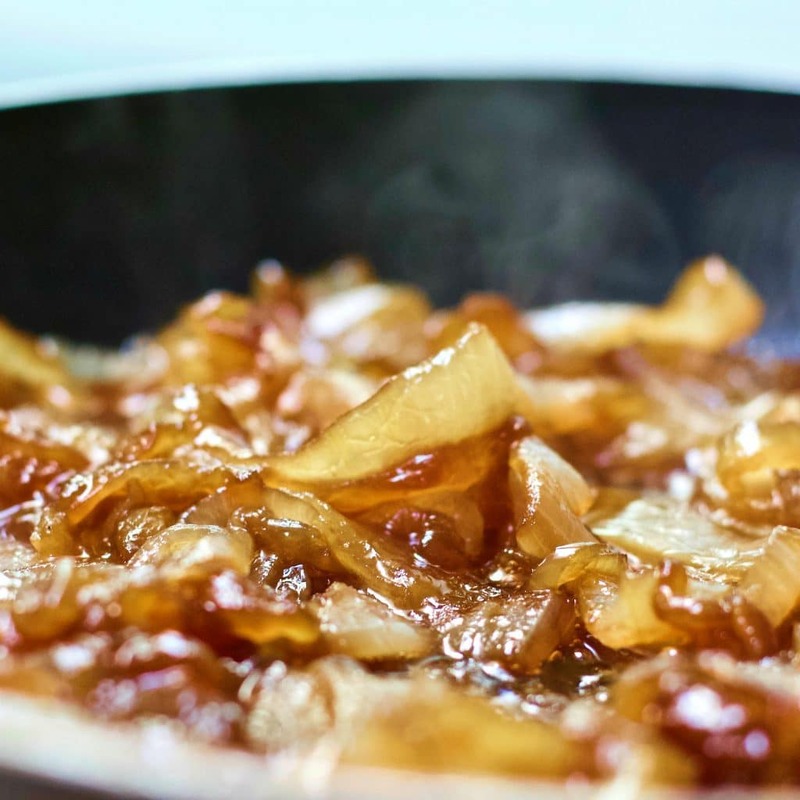 Watch the video on How to make Caramelized Onions in your skillet! Slice the onions into 1/4 inch slices. With your hands separate the sliced onions into rings and set them in a loose pile. Set a [easyazon_link identifier=”B00NAU8L76″ locale=”US” tag=”homefoodjunk-20″]12 inch skillet with a lid[/easyazon_link] on low heat. Melted coconut oil in the skillet and place the onion rings into the skillet. Cover the skillet so the onions sweat. Let them cook a while(about 20 minutes). Occasionally come back and stir them a bit. They should not burn or stick to the pan bottom. Adjust your heat if necessary. Add the brown sugar and balsamic vinegar when the onions are translucent and just a touch browned. Continue cooking the onions until they turn a dark brown and are coated with the caramelized pan juices. I chose Coconut oil for this recipe since its flavor enhances the onions in my opinion. Coconut oil has a naturally slightly sweet flavor. Coconut oil is a great choice for medium and low heat cooking. We love it so thats my choice. You could choose any oil you like but try to find a healthy oil like a good extra virgin olive or avocado oil. Caramelized Onions cooking after adding the brown sugar and balsamic vinegar. The juices will thicken as it continues to cook and caramelize. The onions will go through several stages of doneness before they reach caramelization. From translucent and soft to browned to deep browned and caramelized. This can take quite a while if you really keep the heat low. That will give you very sweet caramelized and flavorful onions. This recipe is easily doubled, or even tripled with these cautions. The onions will cook down so if you have a large enough skillet tripling will work. Adding triple the brown sugar and balsamic is not necessary, however. They are added to enhance the flavor and quicken the process of caramelization. If you over do those two ingredients you may not enjoy the results. 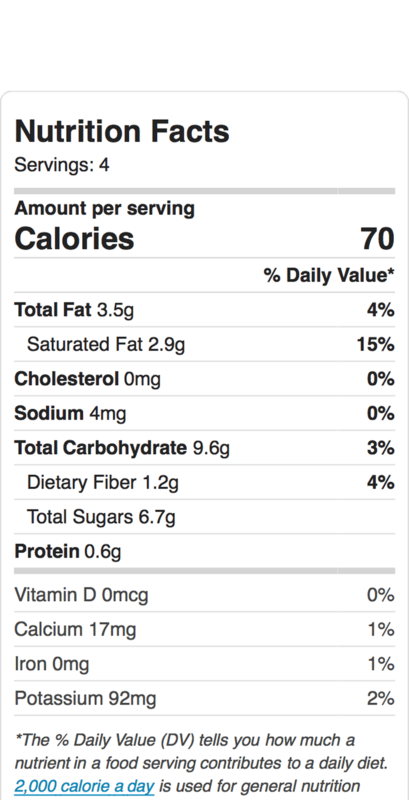 You CAN omit the brown sugar if you prefer to lower your carbs. The onions will naturally sweeten as they cook. The sugar just enhances and quickens the process. Pin this Recipe and share it with your friends. We appreciate your input on all of our recipes. Please rate the recipe! You opinion is highly valued by our other community members. Thank you! Delicious caramelized onions are slow cooked in this special way to add mountains of flavor to many recipes. Put them on hot dogs, brats, beefy sandwiches and hamburgers. Melt the coconut oil in a skillet on medium low heat. Cover the skillet and let them sweat. Check the onions every so often and stir them a little. When the onions are transparent and soft add the balsamic vinegar and brown sugar. Continue to cook them uncovered and watch for the onions to darken and develop a delicious caramelized color. The juices will reduce to a thickness that will tend to cling to the onions adding extra flavor. The onions will go through various stages of doneness. Transparent to slightly colored to deep caramelized brown. Take the lid off and let the juices concentrate after the onions are soft and translucent and just a tiny bit browned. As the cooking continues the onions will darken but should not burn. Pull them off the stove when they reach the shade of caramelizing you want. The amount of time required for this process can vary. The amount of onions, the liquid in them and the heat level all come into play here. Adding the brown sugar and balsamic vinegar will enhance the flavors and quicken the process.